Jordan is at a crossroads, and the path it decides to take will have consequences for the region. For the first time since the Arab Spring protests, thousands of Jordanians from all walks of life have poured into the streets. In a rarity for the country, the protestors have not been led by political parties or organizations. What triggered the mass turnout were proposed changes to the law that would expand the tax base to include many of the humblest Jordanians, all part of an International Monetary Fund-mandated reform package that, in part, is intended to combat tax evasion. The reforms, championed by former Prime Minister Hani Al Mulqi, led crowds of protestors to call for King Abdullah II to sack him. The king did just that. But the protests have continued, with people demanding a change of economic policies rather than just a change of government. It is, in fact, a demand for substantive reform, instead of a vague desire for a change in politicians in power, such as was seen in so many other countries during the misnamed Arab Spring. The time for band-aid solutions in the Middle East may be over. This is not the first time that King Abdullah has replaced his prime minister to ameliorate public unhappiness. However, protesters will not be so easily swayed this time. The fact of the matter is that they want genuine changes in economic policies that will improve their deteriorating standard of living. And perhaps most contentiously for the state and the usual way of doing business in the country, Jordanians also want genuine political reforms, rather than simply be reminded to be grateful for the stability and security of their country. Jordan’s economy has been hard-hit by a series of regional crises, an interruption of gas supplies from Egypt, the influx of Syrian refugees and declining foreign aid. But for ordinary people, it is entrenched corruption and government overspending that are perceived as the real threat to their families’ wellbeing. They want to see the corrupt behind bars, and for officials to trim expenses. And they want to be part of the decision-making process and be represented by a parliament that is not just a rubber stamp council. Lastly, whatever the IMF might tell them, they are just not able to accept another tax increase that takes more bread money out of their pockets. While the tax increase might seem the stuff of academic debate, for many Jordanians this is a bread-and-butter issue – in many cases, literally. Simmering complaints about the IMF-guided austerity measures, which officials say are badly needed to shore up the moribund economy, instigated smaller-scale protests earlier this year. These petered out, leading the Al Mulqi government to think it was in the clear. But Jordanians, in fact, continued to fume over social media as the price of bread doubled. And to add insult to injury, the prices of almost everything else also went up after the government increased sales tax earlier this year. According to the government, changes to the tax law would generate 300 million Jordanian dinars ($423 million) annually for three years. It says this is desperately needed to boost revenue. But if enacted, it would instead hit everyone with a blunt force that threatens to crack the social and political structure of the country. The law will affect influential business people and corporations, and all the way down to the lower-income brackets of society. Worse, the proposed new taxes will further squeeze the dwindling middle class, the backbone of Jordan’s economy, and push more Jordanians toward the poverty line of 813 dinars per year. Unemployment is already at a record high of over 18 percent. Jordan is classified as a low-income country by the World Bank, with a per capita GDP of $3,920. Also, according to the Bank, Jordan’s economic growth is nowhere near what the country needs. Growth is only expected to increase by 2.4 percent this year and 2.5 next. It was 2.1 percent in 2017. Indeed, Jordan’s economic woes are not going to be alleviated only by fiscal measures that increase takings by the exchequer; it needs political reforms that provide a wider margin of freedom for private economic activity. Jordan has so far managed to sidestep the violence that has engulfed the wider Middle East. Its security forces in the past have managed to contain discontent by detaining or arresting activists and then releasing them. Some of the current protesters have called on the king to intervene directly on their grievances because they have lost faith in the government. This worked in the past. For example, riots erupted in 1989 in Maan, an impoverished and often restive city in the south, after the dinar lost a third of its value, inflation jumped to 25 percent and food prices skyrocketed. In response, the late King Hussein resumed parliamentary elections after a lull of 22 years. While it did not address the issue that caused the city dwellers’ unhappiness, it managed to defuse the tension. The current impasse offers an opportunity to address reforms toward both the political and economic arenas. While King Abdullah has rightly acted as his father once did and has responded to the demands of his countrymen by changing the prime minister, these recent protests require more than the old prescriptions. Today, in some parts of the country, there are Jordanians who have gone into debt just to buy bread, the staple food. Now, Jordanians want effective and prudent economic reforms. Jordan’s economy is its most dire national security threat. How the new government responds will ultimately determine national stability. 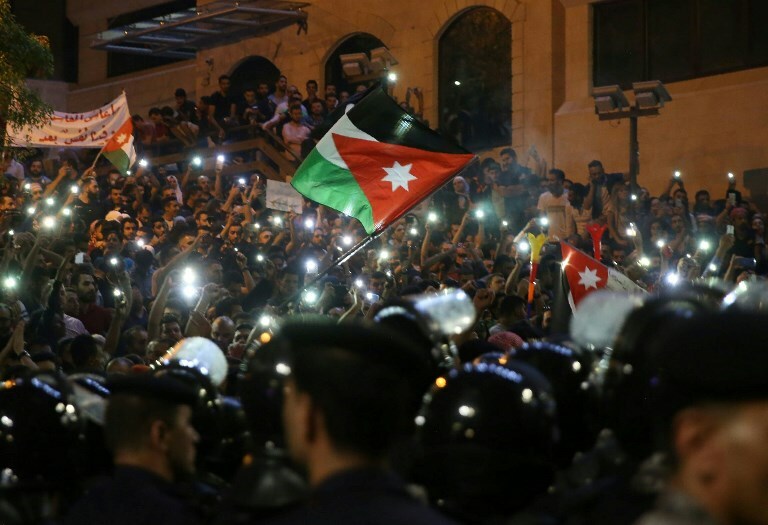 The Jordanian protests shows a developing maturity in what drives the people of the Middle East toward substance in reform, rather than the noise of the early Arab Spring. Suha Ma’ayeh is a journalist based in Amman, Jordan.